At Finn Moto we currently have three saddlebag options to fit the Triumph Thunderbird perfectly. From left to right there is 110XL, 510L & 512L. The 110XL is a spacious classic saddlebag option with two external straps with quick release buckles, its available in a cost effective non-lock & lockable version. The 510L is the smaller version of the 512L, designed specifically for the Triumph Thunderbird with its sleek clean lines and frontward opening lid allowing you easy access when out on the road. 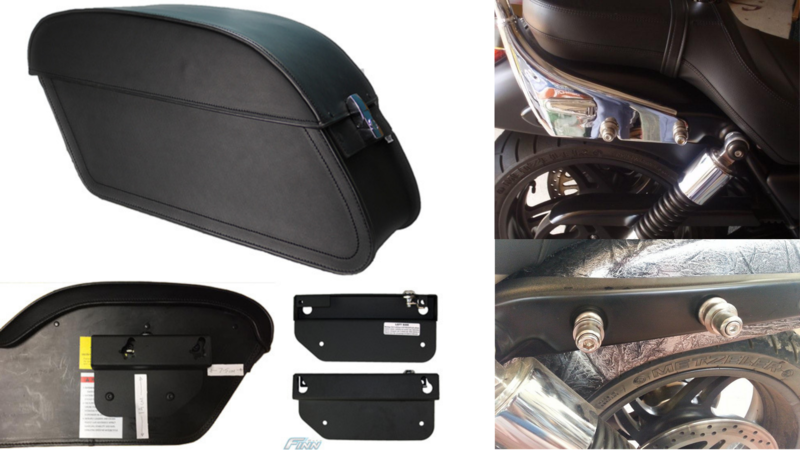 The 512L Motorcycle Saddlebags has been by far the most popular choice for Triumph Thunderbird Owners fitting perfectly inbetween the shock absorber & indicators you have the maximum amount of storage whilst still looking sleek on the bike. Because of the higher turnover of this style its safe to say this model bag has well and truly been perfected; it includes features that you & your pillion will love such is inner lid organiser, internal nylon removable bag & chrome latch lockable lid. The bags measure approx 20inch / 51cm end to end & 23inch / 60cm from very back to very front giving you over 20L capacity for each bag. If you don't like the size of the 512L, a smaller version is available 510L which is 17inch / 43cm in length (approx 17L capacity per bag) 510L Motorcycle Saddlebags. To fit these bags you'll need some Motorcycle Saddlebag Brackets, there are a few different ways to do it but we found majority of riders want a fast, flexible, clean & lockable solution. You wont find this with a fixed mount U shape brackets which is cheap but a really annoying saddlebag support; imagine everytime you would like to remove the bags be it to take inside when out on a road trip or clean the bike you will have to unbolt the bags & then your left with some ugly chrome bracket when the bags are off. The solution is Easy Brackets - engineered motorcycle & hardware specific lockable saddlebag bracket that slides on and off in seconds leaving no ugly hardware on the bike when the saddlebags are off. The docking post which the bracket mounts onto are called keepers & look similar to the lugs used for a detachable backrest, they blend in with the bikes rear fender allowing you transform your motorbike to suit the ride day in seconds. Fitting is really easy, you only need simple tools such as a socket wrench, allen keys, marker, drill bits & a drill. Using the existing rear fender bolt holes you can bolt the keepers onto your bike with the included longer bolts, the bracket slides on and your ready to drill & bolt the saddlebags to the bracket. Fitting the saddlebags to the easy bracket gives you the flexibility to position the saddlebags to suit your specific motorcycle setup. We carry the whole range of Easy™ Brackets for Triumph owners, covering fitments for America, Speedmaster, Thunderbird, Thunderbird Commander, Rocket 3, Adventurer and more. Available in kits to fit with & without hardmount & detachable backrests. Because we make our Easy Brackets specifically for your Triumph model, you will receive all of the correct hardware with your order. The docking posts and bolts are especially designed to work perfectly with your Triumph motorcycle, eliminating the hassles of adding spacing washers to either line up the docking posts or to achieve a good, tight fit.